the bluing looks pretty good...I would say excellent for the age. There are some dents and dings....minor handling really. Having one of those would be awesome but two is heavenly! Very nice! I love target 22 rifles. My buddy(Dillon 1050 and Cement mixer guy) has the Mossberg you mention in an unfired state. He also has a Remington 40X and another one might be the HR. My other good buddy (gunsmith) has a Remington but I don't know which one. A case of Tenex is running about $175 and we are about to smell a bunch of rimfire powder. My first time really using this type of sight system. Still not confident with the sight picture I'm getting. Jester came through on a nice firearm. I was pleasantly surprised with condition and can’t wait to shoot her. Arrived just as promised to my FFL. Picked it up today. Great doing business with ya. Thanks Jester. Man I am GLAD you are happy! 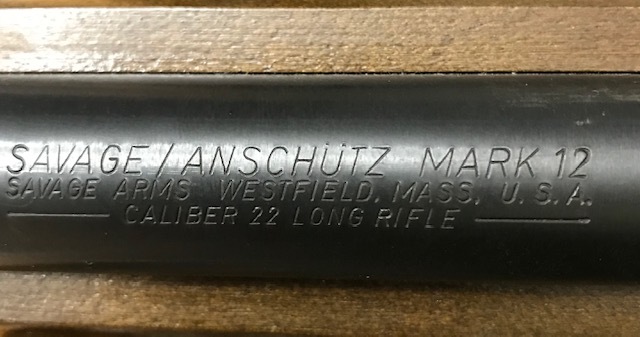 The guy had them numbered on the front right under the barrel. I am sure they all shot a little different. You see what # you got ...right? Graf ran a sale on the S-K and I missed it trying to decide how much to buy...now they are out. Next closest price is Champions Choice. I ordered a box of Tenex and a couple others to try. So far the S-K is working in mine. If I can send you a piece of a box of something to try let me know. I think the reason the Benchrest didn't shoot well is the lub was drying out...kinda chalky. I ran my scope down your barrel and it looks GREAT! I think if you run a wet patch in your it will be fine...no build ups at all. Keep me posted on how it shoots...might have to bump up there for a Match with ya. Thanks I will try the S-K first. 10:4 on the shoot I will check out the number. BTY I think my FFL wanted to keep it. Thanks again. BTY I think my FFL wanted to keep it. we coulda got him one...probably still available or the better grade 54...think he is asking $1,750 for that one with the 15X scope. Don't know if I mentioned it but the Possum Hollow #108 I believe is the bore guide for it and to remove the bolt hold the trigger to the rear. Got new inserts for my front sight and decided I would try to shoot my first ever match. After I put my target up the RO said he didn't realize I was shooting open sights and told me I could change out my target...I looked him straight in the eye and told him it sure was a long walk down there and back . Kind wish I had now...those red targets are hard to see with open sights. On the second relay I decided to use the open sight targets and boy were those easy to see. took one for a sighter just to make sure...felt a little off when I sent it but it was in. What are you shooting the 10.s with? Q1 I did a little research and ordered s& k and the Federal. We will see how it goes. there is a big difference in the scoped rifle (red) and the black ones sight/vision wise. I can't see the reds well at all with my vision. It was more a send and hope on that relay but I wore them out on the next one. There were a bunch around the back of the RO's truck talking about me doing that with peeps....I walked up and asked if they were talking about me...RO snapped out...they sure are...I told them they needed to stop...it might hurt my feeling. They asked if my middle name was sandbag....told them nope...Bullbag I had a big time!